I began the final day of the year in a place that is a long way from a ball drop in Times Square. 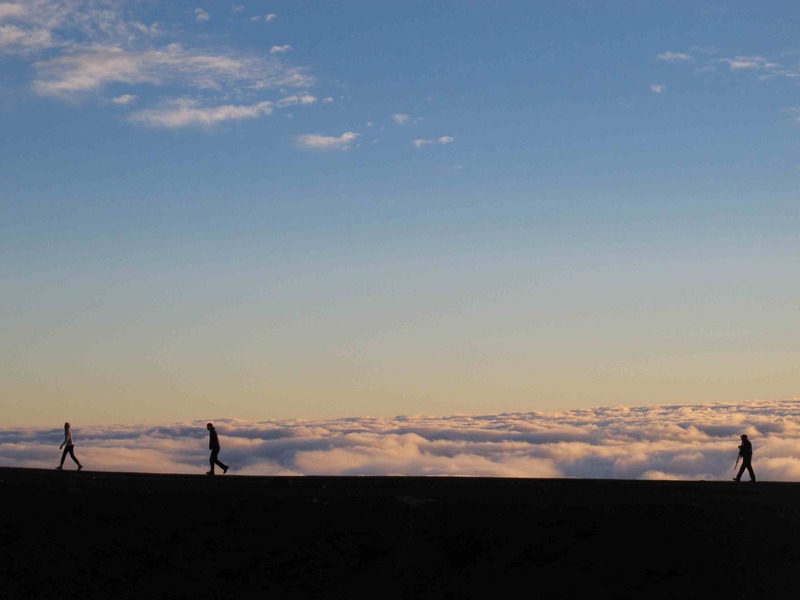 It’s a place where people go to watch the sun rise and drop; a place that, according to data collected by sound experts, might be the quietest spot on Earth — the volcanic crater at Haleakala National Park in Maui. I chose to end the year in Haleakala partly because it seemed like a natural bookend to the start of the year — a New Year’s Day sunrise in Acadia National Park in Maine — and partly because of the story behind the name (which means “House of the Sun”). According to ancient lore, the demigod Maui lassoed the sun, forcing it to slow its trip across the sky and extending the day. I can relate to that wish. Not long after that final sunset of 2012, I was on a plane back to Florida. Back to a city that despite some things I wish I could change — can we build a few mountains? — I’m happy to call home. Sorry, but even though the guest columnists did such a good job in 2012 — too good, I feared at times — my drivel is back. I could write a book (and hope to eventually do exactly that) about what happened between that first sunrise in Maine and the last sunset in Hawaii. For now, I’ll just share a few lingering thoughts from 2012. If someone from Maine tells you that the weather actually is quite warm, remember that they are from Maine. Your favorite national park is the one where you went with your parents, your children and your friends. Quite a few people have asked where I went last year. So here’s the quick rundown: Acadia National Park in January, Saguaro National Park in February (and several other months), Glen Canyon National Recreation Area in March, Grand Canyon National Park in April, Dry Tortugas National Park in May, Yellowstone National Park and Little Bighorn Battlefield National Monument in June, Gateway National Recreation Area in July, Yosemite National Park in August, Flight 93 National Memorial in September, Olympic National Park in October, the Western Archeological and Conservation Center (and a cross-country road trip) in November and Haleakala in December. It is nearly impossible to pick a favorite. I am reminded of what Dayton Duncan, the writer behind Ken Burns’ PBS series, said when I went to New Hampshire to talk to him before beginning my project. Never underestimate the lure of bison poop. The family went along on one trip, to Yellowstone in June. When we were on a hike near Old Faithful and Mia’s camera battery was dying, she was faced with a choice. Get another geyser shot or take a picture of a pile of bison manure. The manure won. When I grow up, I want to be a park ranger. Although after spending a lot of time with rangers, I am convinced they all are smarter, tougher and nicer than I am. I will be forever grateful for all the time that people in the park service, and some outside of it, spent with me in 2012. I am even more grateful to my wife for helping to make it possible for me to spend all that time with them. Preservation is an eternal battle. You hike into the Grand Canyon and it’s hard to fathom this place not being a national park. And yet it took nearly four decades of intense political battles before it achieved that status. And nearly 100 years later, the battles continue. About the air above the canyon, the water running through it, the mining rights nearby, and on and on. It reminded me of a few years ago when for my mom’s 70th birthday, she did a trip with each of her three children. She and I went to Utah and did a rafting trip, spending a few nights at Arches National Park. After doing the Windows Walk hike there, the ranger handed out his version of business cards. Only they didn’t have his name, just a quote from the late John Sawhill, former president of the Nature Conservancy. There is something to be said for revisionist history. While in Yellowstone, we camped at Madison Junction, a spot that for decades was trumpeted as the site of a campfire that led to the birth of the national parks. The “campfire myth,” as it now is called, was debunked by a park historian. Which makes me appreciate the symbolism of the place even more. History rarely is simple. And when we try to simplify it, we often get it wrong. There’s something to be said for old-fashioned maps. I say this not just because I got lost several times relying on GPS. As amazing as technology is today at capturing the beauty of the parks — now you can “virtually hike” several national parks while sitting at your computer! — it doesn’t do them justice. And not just because it simply can’t capture the grandeur. Partly because it doesn’t capture the discomfort. There’s something to be said for being cold and hot, tired and sore. And for being disconnected. For years, I’ve kept a fortune cookie with that message in my wallet. Not that I necessarily followed the advice. When I went to Arizona in February, the plan was to spend time in the desert focusing on the future of the saguaro cactus. I ended up in a hospital room, focusing on my mom and her future. When she died in June that was one thing that gave us solace: She didn’t leave much undone in her life. During the year, I went for a hike in Saguaro National Park with Ross Zimmerman, the father of Gabe Zimmerman, an aide to Gabby Giffords who was killed in the Tucson shootings. And I walked through the woods at the Flight 93 crash site with Lori Guadagno, sister of Richard Guadagno, one of the passengers. I did this ostensibly to learn about these places and their loved ones. But it also made me think about loss and the healing power of such places. And it made me more determined to follow the fortune-cookie wisdom. Live life. Now. Wherever you live — including here in Florida and Georgia — don’t forget that you have National Park Service sites right in your backyard. A few weeks ago I went to the Theodore Roosevelt Area at Timucuan Preserve and walked the Willie Browne trail to the Round Marsh overlook. This might be my favorite spot in all of Jacksonville. But after a year spent traveling, I feared it might leave me feeling underwhelmed. It didn’t. It was peaceful and beautiful. And it felt familiar, like home. Yes, it is hard to let go of 2012 — part of me wants to be like Maui and throw a rope around the sun — but it also is good to be home.